I’ve always had an incredibly vivid imagination and have strong memories especially from my childhood, mostly of specific images. Recently when Sam and I were in Hong Kong I had one of those déjà vu moments that stopped me dead in my tracks and gave me goosebumps. 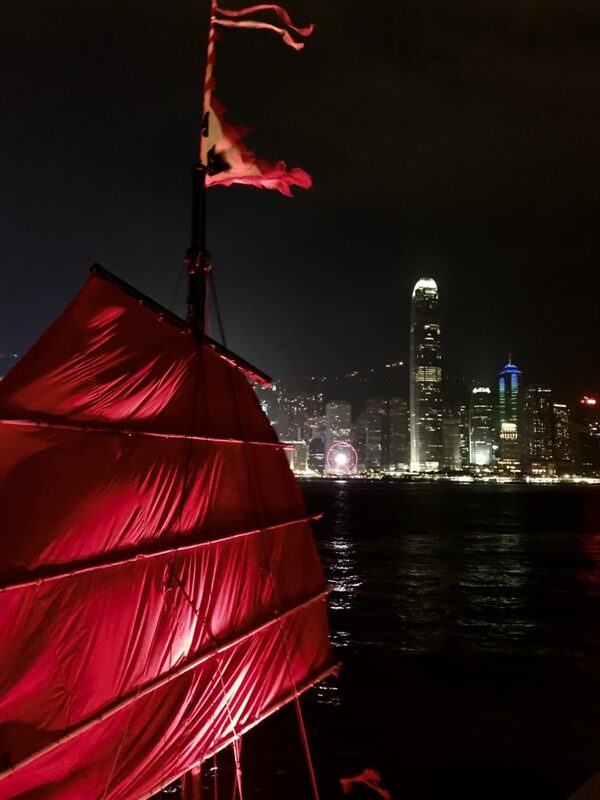 For those of you that saw my night photo of the Chinese junk in Victoria Harbour with the red sail on Instagram…yep, that was the one! It’s the photo attached to this story. As I lined up for the shot with my iPhone (yes, didn’t have my Canon with me as I strolled late that night) something struck me as familiar, but I brushed it off not really thinking anything more of it and took the shot. However, after taking the photo as I looked at at it on my phone it hit me… I shivered visibly at the image in front of me because I instantly recognized the image as one I’d seen before, but not since I was a child which was close to 50 years ago. This specific image has somehow burned it way into my psyche at as a kid with its vibrant red sail and dark the Hong Kong skyline in the background… Yeah, it freaked me out as well! I don’t know the science behind a déjà vu moment, but clearly our brains are incredibly powerful and somewhere in the recesses of its memory banks it recognised this specific image from another time. Recently I met someone under similar circumstances, purely by chance, at the moment we met there was an instant connection and we recognised each other but were unsure as to where and when. Subconsciously we both have been racking our brains trying to figure out under what circumstances had we met before. To be honest I think we both felt a little foolish that we each seemed so familiar to each other and yet neither of us could put our fingers on exactly where or how we’d met previously. There was an instant easiness in our interactions, for those of you that know me this is quite unusual as it generally takes me quite a while to warm up to people and really trust them. However not in this situation as at some level there was a deep and innate recognition of each other…but from where. To this day we can’t figure it out! I suppose we all have moments like this, but these types of occurrences never ceases to amaze me. For me at least, it begs the question “did I know them in a prior life?” Yes. I know it sounds a little flaky and a bit of an odd question but one that has to be asked given the situation. Now there are definite benefits to being open to any and all possibilities, no matter how crazy they may sound. As a writer my imagination fuels my fictional writing, and having the ability to suspend your traditional beliefs and thinking in order to free your mind for writing creatively is something that I’ve picked up over the years. In fact, it fits with the concept of Improv which I studied at The Second City. Everything is accepted under the guise of “yes, and…” which is the absolute cornerstone of Improv comedy. You just take whatever is put in front of you and then add to the story from there, which is awesome when you’re writing pure fiction. If any of you have read any of my “Hanoi Posting” micro fiction serial you’ll understand. These short, sharp vignettes are a composite of another era with a cast of characters developed from no one in particular. Yet when I write each episode I can actually feel the heat and humidity of Hanoi, see the characters in my minds eye as plainly as if they are right in front of me and sense their emotional state during each scene as it plays itself out for the reader which is an enormous benefit when you’re writing content like this. I guess that’s why when I sit down to write I need to be in the moment otherwise I struggle to begin a new episode, however if I am ready and in the mood to write then the stories literally flow out of me like water from a tap. It’s clear that my writing provides me with a creative outlet much like my photography does, and given that I’m so visual these genres serve me perfectly in terms of quenching my thirst for the creative outlets of my life. Interestingly, I have always had some form of creative pursuit on the go, and although the current renderings are my writing and photography I’ve dabbled with painting, drawing and graphic design over the years as well. I think identifying the things that bring you joy and contentment in life are so important to nourish your soul, however that being said not everyone is the same and what serves the needs of one person will not be the same as another’s. Yes, I’m fortunate to have figured out these things albeit with a lot of navel gazing and hard work but now I feel like I’m getting into my stride with both my writing and my photography and who knows what the future will bring. Perhaps I’ll have more déjà vu moments from my childhood…now wouldn’t that be something! 0 Comments on "A distant memory…"